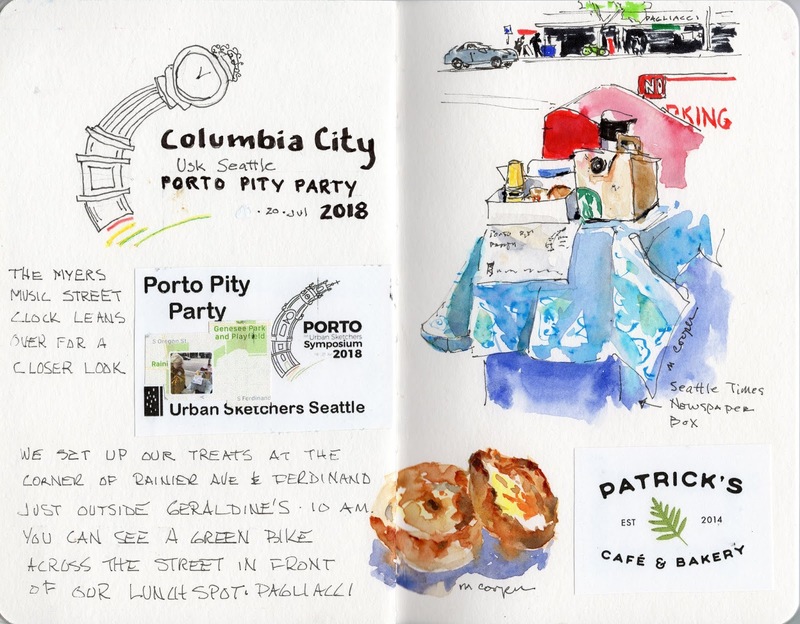 In a show of solidarity with our fellow sketchers in Porto, Portugal, Usk Seattle met in the Columbia City neighborhood today. We knew that the participants at the Porto Symposium were attending workshops and sketching on the street in Portugal at this very same moment. A sketchers' party on the street. Kate on pastry security duty. Kate made badges and signs for our "Porto Pity Party" and Michele and Kate cooked up a surprise for those who met at "Geraldines" corner this morning. There were fresh baked Portuguese style pasteis de nata and our own Starbucks coffee to start the day. Patrick, USkSeattle friend and baker, came through with the tasty egg custard tarts. Thank you, Patrick! In true urban style, we spread a Portuguese print tablecloth over the Seattle Times newspaper box (Hi, Gabi!) and everyone helped themselves. As we walked down Rainier Ave toward the Columbia Branch Library, Kate and I talked about the dramatic changes in the neighborhood since it was built. The branch's landmark 1915 building is the smallest of the libraries built for Seattle with gifts from philanthropist Andrew Carnegie (1835-1919). 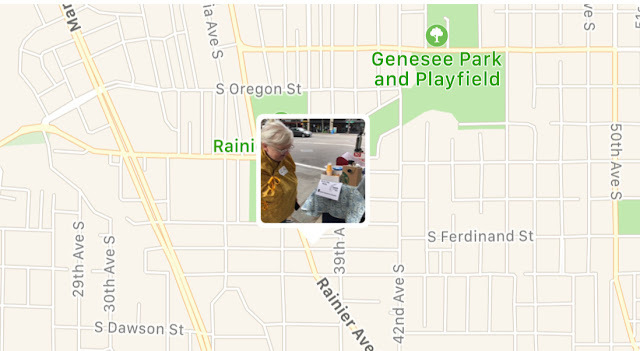 The branch itself dates to 1909, two years after Columbia City was annexed into Seattle. Carnegie would be astounded at how the library is used today. Not only can you pick up a great book for your summer reading, you can play a game of chess, catch up on your email, research anything online or even engage in a popular art activity. You can download and print a coloring sheet for your branch. Coloring sheets are available for all 27 Library locations. 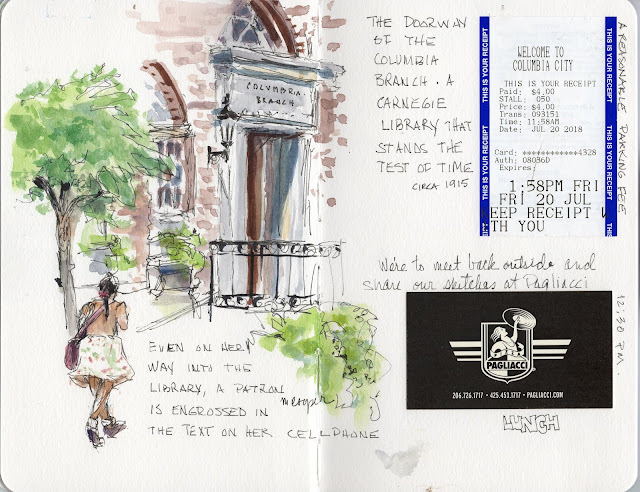 What a great way to start your urban sketching skills! We are also celebrating the 9th Anniversary of the founding of Seattle Urban Sketchers. Kate had signs made up for that, too, which we proudly displayed at our sketchbook throwdown. See Kate's blog post with more photos. Then we had lunch at Pagliacci. Excellent report on the day! I love your logo design mimicking Porto's!! Thanks so much, Kate. We made a great team and didn't have to feel too sorry for ourselves after all.